Digital Marketing Instagram Marketing Marketing Mistakes Pinterest Social Media Should You Be Marketing on Pinterest or Instagram? Visual content marketing is one of the hottest digital marketing trends these days. People are more interested in seeing information rather than reading it, and as a result, visual marketing platforms like Pinterest and Instagram have experienced a significant increase in the number of users. To make your marketing journey a little easier, we have written this article to help you with your selection of a visual marketing platform. There is no definite answer to this question that which one of the two visual marketing platforms is better. It depends on your business and your target market. You need to look into market data. Study users’ demographics and identify the platform that can offer you the maximum exposure to your target audiences. We are presenting the demographics of Pinterest and Instagram users in the following table and saving you from purchasing this valuable data. Also, if you spend a little time on both websites, you will identify that the audiences of Pinterest and Instagram have some specific interests. For example, Instagram users are more interested in following brands and celebrities, while Pinterest’s audiences look for DIY products, How-to videos, tips, etc. Therefore, when marketing on Pinterest, you will have to create more informal content to engage your customers. On the contrary, Instagram marketing needs authentic content that showcases ‘behind the scenes’ pictures and video clips, and helps users connect to the brand. Marketing a business on Pinterest or Instagram requires you to understand the key marketing attributes of both the websites. Here is a list of them. Pinterest offers you an easy reach to the user. The pins link the user to a website, and hence help in increasing website traffic. On Instagram, you are not provided with this luxury. Instagram is about showing beautiful pictures of your products to the user and increasing brand awareness. 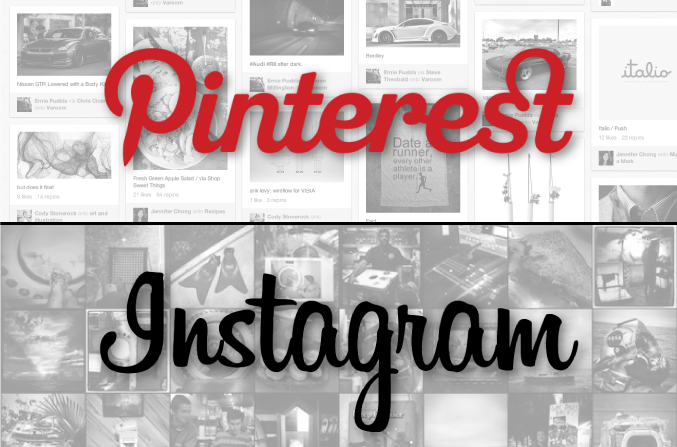 On Pinterest, your pin must compete with other pins on the board to grab a user’s attention. On the other hand, Instagram allows users to view one picture at a time, offering your brand exclusive user attention. Pinterest’s smart feed shows pins to the users on the basis of their interest, increasing both relevance and effectiveness of the content. On Instagram, pictures are shown in chronological order, so users can see your content only if they happen to login right after you posted something. uptick in visitors to my site. An uptick so large, in fact, my email listing gained nearly 1,000 new subscribers in that first month alone! (And this is from someone who spent 6 weeks prior floundering with her email list development.)"